Pharmaceutical Founder Arrested In Alleged Nationwide Opioid Scheme : The Two-Way John Kapoor, who co-founded Insys Therapeutics, has been charged with racketeering and fraud for allegedly bribing doctors to overprescribe the company's powerful opioid spray. 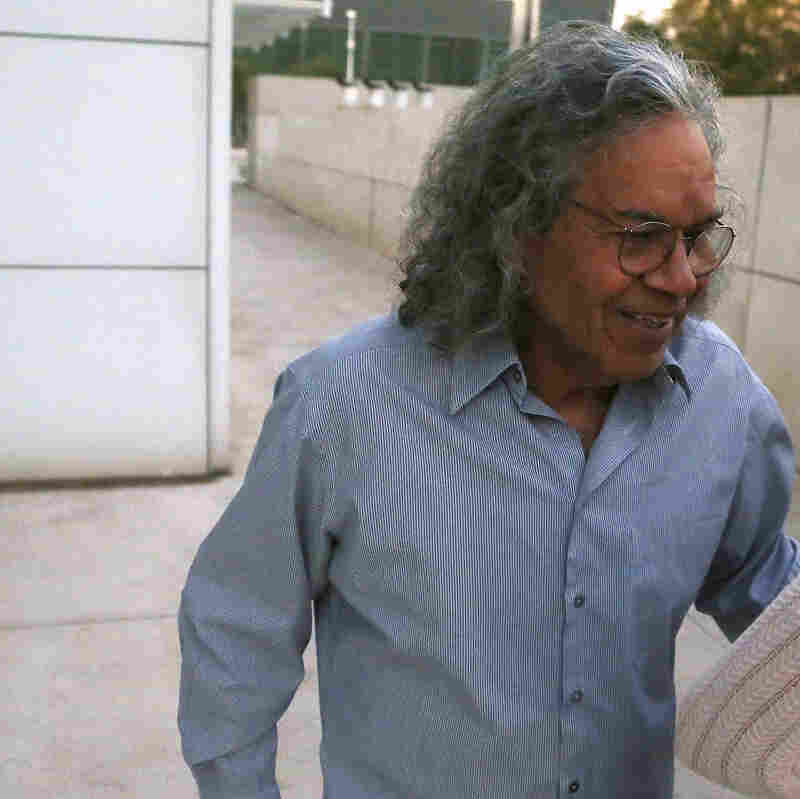 Billionaire founder of Insys Therapeutics John Kapoor leaves U.S. District Court after being arrested earlier Thursday in Phoenix. Kapoor and other defendants in the fraud and racketeering case are accused of offering bribes to doctors to write large numbers of prescriptions for a fentanyl-based pain medication meant only for cancer patients with severe pain. Subsys, as the drug is known, transmits the extremely powerful narcotic fentanyl in spray form, allowing it to be placed beneath the tongue for fast, potent pain relief. It is meant only for treating cancer patients suffering from severe pain. But according to prosecutors, Kapoor and several other former high-ranking executives at the company conspired to bribe doctors to write "large numbers of prescriptions for the patients, most of whom were not diagnosed with cancer." They also allegedly "conspired to mislead and defraud health insurance providers who were reluctant to approve payment for the drug when it was prescribed for non-cancer patients." "In 2015 a nurse practitioner in Connecticut pleaded guilty to violating a federal antikickback statute by taking money from Insys to prescribe the drug to Medicare patients who did not have cancer. A former Insys sales representative in Alabama also pleaded guilty to a conspiracy to violate the antikickback statute by paying two doctors to prescribe the drug. Illinois has filed claims against Insys related to pushing Subsys for unapproved uses. U.S. attorneys in two jurisdictions — the Central District of California and the District of Massachusetts — are investigating the company. Doctors who have worked with the company are being investigated by Michigan, Florida, Kansas, New Hampshire, Rhode Island and New York." As Reuters reports, Kapoor stepped down as chief executive in January. "In the midst of a nationwide opioid epidemic that has reached crisis proportions," acting U.S. Attorney William D. Weinreb said in a statement, "Mr. Kapoor and his company stand accused of bribing doctors to overprescribe a potent opioid and committing fraud on insurance companies solely for profit. "Today's arrest and charges reflect our ongoing efforts to attack the opioid crisis from all angles," Weinreb added. Kapoor was arrested in Arizona, where Insys is based, and his indictment was filed in federal court in Boston. Prosecutors say the charges of conspiracy to commit racketeering and conspiracy to commit mail and wire fraud each carry a maximum sentence of up to 20 years in prison. Conspiracy to violate the anti-kickback law carries a possible penalty of up to five years in prison.